Canadian supplier Magna International, in cooperation with Ford Motor Co., says it has developed a prototype carbon fiber composite subframe that reduces mass by 34 percent from a stamped steel equivalent. 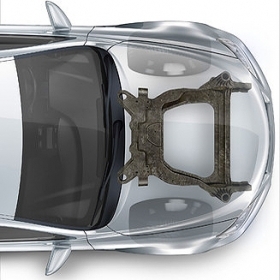 By replacing 45 steel parts with two molded and four metallic parts, the prototype subframe achieves an 87 percent reduction in the number of parts used. The moldings are joined by adhesive and rivets. Magna, in a statement Tuesday, said it worked with Ford to investigate potential benefits and technical challenges of using carbon fiber-reinforced composites in chassis. “We must continue to work hard to achieve these lightweight solutions at the most affordable costs. Magna and Ford working together on this carbon fiber composite subframe is a great example of collaboration on advanced materials,” Mike Whitens, director of vehicle enterprise systems within Ford research and advanced engineering, said in a statement. Magna International ranks No. 3 on the Automotive News Europe list of the top 100 global suppliers with worldwide original-equipment automotive parts sales of $32.1 billion in 2015.